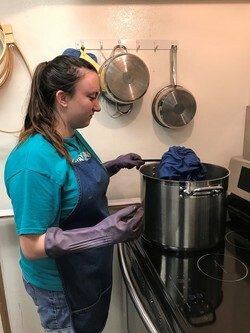 Chandler senior theater major Jessica Griffin dyes fabric for one of the costumes she designed for "The Post Office," one of "Three One-Acts Plays by Asian Authors" the School of Theatre will present Feb. 26 through March 2 in Turner Auditorium of the SFA campus. NACOGDOCHES, Texas - Presenting three different plays in three different styles on one stage in one night takes detailed logistical planning and coordination among designers. That's what the Stephen F. Austin State University School of Theatre accomplishes when it presents "Three One-Act Plays by Asian Authors" Feb. 26 through March 2 on the W.M. Turner Auditorium stage. Rick Jones, professor of theatre at SFA, directs the show, which features the one-acts "The Post Office" by Rabindranath Tagore; "The Lady Aoi" by Mishima Yukio; and "Hiding from the Rain" by Gao Xingjian. Each play has a differenct student costume designer: Jessica Griffin for "The Post Office," Jordyn Averitte for "The Lady Aoi" and Kate Berry for "Hiding from the Rain." They were all students in Professor Angela Bacarisse's costume design class last fall, and one of their major projects was to work on these plays. Jones visited the class a few times to talk about the plays, look at their concept boards and sketches, and finally to sign off on the designs themselves. Averitte said going through the design process with fellow student designers was fun. "It was interesting to see each design form as we went along," she said. "The biggest challenge for me has been tailoring patterns to match my design during construction. I wanted my designs to be intriguing and represent the characters and their backgrounds." Working on "Hiding from the Rain" was a great experience for Berry as a new costume designer. "This show presented a couple of unique challenges in the design aspect of it in that the two female characters, Bright Voice and Sweet Voice, on the surface, can appear very similar and almost as if they are the same person," she said, "so it was important for me to show that they were different but also connected in some way. I accomplished this by distinguishing them in color as well as style." One of her goals was to showcase the color red. "In Chinese culture, red symbolizes wealth and prosperity, which the two girls are experiencing, so each of their costumes has red in them," she said. "Using red also helped to show that the girls are connected. The Old Man presented his own unique challenges because I wanted to convey how he is almost the opposite of the two girls in terms of status in life and attitude towards life, as well." Moving three different set designs on and off the stage quickly in between the performances presented a bit of a challenge for scenic designer Kenneth John Verdugo, assistant professor in the School of Theatre. "He had to devise a system to get one entire set off and another on in only a few minutes," Jones said. "And our lift really has to stay in one place throughout. "We went back and forth a few times about what order we should present the plays," he added. "It makes more sense thematically to do it one way, but it's better logistically to do it another, and so on. And I've never tried anything like this before. We've been doing some learning on the fly." The first concern for Verdugo was that each set would need to be portable enough for the needed transitions while also being sustainable enough to stand alone to serve the individual play. "It was important to keep the design essential - not overstated but specific enough to tell a story," Verdugo said. "For practical purposes, there is one scenic element that is constant - downstage platform - but is only used in one of the three plays." "The Lady Aoi" and "Hiding from the Rain" are fairly contemporary - or at least lend themselves to a more current setting, according to Verdugo. "The fact that these are not three Asian plays but rather are three plays by Asian authors allows for the design to remain within the context of a setting that is familiar to our Western audience," he said. "'The Post Office' felt a bit more timeless and perhaps archaic in some respects. I believe this is reflected in the costumes. As such, I followed the lead of the costume designers. "The costumes and the language of the text do not feel or read as contemporary," he said. "How one arrives at what can be considered timeless, or rather not specifically of a particular time period, was a challenge. Design is a combination of such factors, as well as essential collaboration in style, color and scale." Verdugo believes the challenge of presenting three different plays on one night has been a good learning experience for students. "I believe students are seeing that effective design does not have to be elaborate or overstated," he said. "The three different environments are very distinct, each providing only what is needed to tell the story. They have prepared an evening of performances that are not constructed within a traditional framework. "Students were given the task of setting and re-dressing multiple units in a single evening of performances," he added. "They are learning to keep each setting consistent by hitting their mark each night. "I believe the challenge of the evening is to produce three very different plays that are linked through cultural sensibilities and language that is profound, often poetic and hopefully accessible." "Three One-Act Plays by Asian Authors" will be presented at 7:30 p.m. Tuesday through Saturday, Feb. 26 through March 2, in Turner Auditorium in the Griffith Fine Arts Building, 2222 Alumni Drive, on the SFA campus. Single tickets are $15 for adults, $10 for seniors and $7.50 for youth. Tickets for SFA students are $5. For tickets or more information, call the SFA Fine Arts Box Office at (936) 468-6407 or visit http://www.theatre.sfasu.edu/.